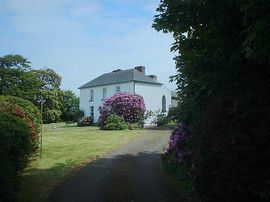 Hafod Grove House is a delightful mansion house with sea views and enjoying a lovely setting within the beautiful Pembrokeshire National Park. 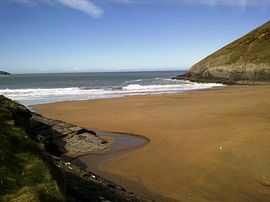 Within walking distance of the Pembrokeshire coastal path and charming Ceibwr Bay. The house is very spacious and comfortably accommodates up to 12 - 18 visitors 12 in Hafod Grove House and 6 in Hafod Villa. Ideal for Family reunions or large groups as the kitchen table in Hafod Grove House can accommodate 12 - 18 Long Weekends are available out of season. This part of the Park offers the most wonderful scenery; lovely, sandy local beaches, with rock pools and easy vehicular access. There are frequent sightings of seals, dolphins, basking sharks and even whales and turtles at times. The rare red kite is seen frequently flying above the grounds and there is an abundance of Flora and Fauna. Situated between the The quaint Market Town of Cardigan and the pretty village of Newport, it makes an ideal touring centre to explore three counties. Loads of outdoor activities and things to do including, golf, fishing, riding, walking, cycling, coasteering, canoeing kyaking and sailing. There are art galleries, out door and indoor theatre, craft tours, castles and historical sites to visit, pubs and restaurants to sample, markets and shows to visit. *Special deals on winter breaks and smaller groups who fancy a little luxury. 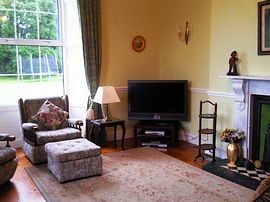 Hafod Grove House is a lovely, period mansion house with spacious accommodation for up 12 people. There are lovely sea and country views from the front bedrooms and large grounds. 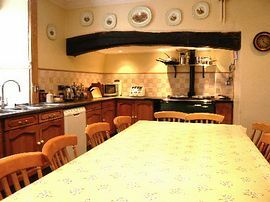 Large Farmhouse Kitchen, seating up to 12 people; well equipped with an AGA, gas cooker, dishwasher, microwave, etc Washer/Dryer. Two reception rooms, both double aspect, one leading to a delightful sun trap patio, which is ideal for dining alfresco and barbecues. 1. Downstairs Double Bedroom with antique suite and Shower Room opposite, which makes it ideal for the elderly or semi-ambient. Luxury En-suite Bathroom with double-ended, antique bath, power shower etc dual access. 3. 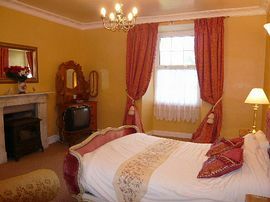 Double Bedroom with king sized bed and antique suite + vanity unit. 4. Double Bedroom with twin beds and decoupage suite and pretty garden views + vanity basin. 5. Double Bedroom with art deco twin bedroom suite and pretty garden views. 6. Bunk Bedroom ideal for children, over-looking woodland. Family Bathroom 6' Bath Power-shower and WC. There are cots and high-chairs available on request. The house stands two acres of gorgeous private gardens, including a huge lawn, woodland and shrubs. There is a lovely sun trap patio/ barbecue area and swings for the children. There is a sweeping tarmac drive with parking for 5 cars. Gorgeous Period House with Sea Views. Over Two Acres of Private Garden. Limited facilities for semi ambient or elderly, downstairs bedroom and shower room. up to 2 well behaved dogs are allowed in Hafod Grove for £25. Swings and barbeque patio area. In total just under 2 acres of garden. for 12 £925 weekly; £625 for the weekend. £825 for 18 for long weekends. £1025 - £1525 p.w. Friday - Friday for 12, School Summer holidays £2075 for 12 and £2900 for 18. £1250 - £1875 Saturday - Saturday. All prices include: dogs in Hafod Villa, linen, central heating, Sky TV & Broadband access and Booking cancellation insurance, 1st basket of logs free. Open all year Friday to Friday. After October We offer long weekends out of season for £825 for 18. £625 for 12, inclusive for 18 guests, unfortunately now we have to charge a £50 oil suppliment from October - Easter.